Bari Karol Wojtyła Airport (Italian: Aeroporto di Bari-Karol Wojtyła) (IATA: BRI, ICAO: LIBD) is an airport serving the city of Bari in Italy. It is approximately 8 km (5.0 mi) northwest from the town centre. Named after Pope John Paul II, who was born Karol Wojtyła, the airport is also known as Palese Airport (Italian: Aeroporto di Palese) after a nearby neighbourhood. The airport handled 3,958,815 passengers in 2015. The airport of Bari was originally a military airfield, built in the 1930s by the Regia Aeronautica. During the World War II Italian Campaign it was seized by the British Eighth Army in late September 1943 and turned into an Allied military airfield. Until the end of the war in May 1945, it was used by the Royal Air Force and the United States Army Air Forces Twelfth and Fifteenth Air Forces both as an operational airfield as well as a command and control base. In addition the airfield was used by the Italian Co-Belligerent Air Force (Aviazione Cobelligerante Italiana, or ACI), or Air Force of the South (Aeronautica del Sud). After the war it was turned over to the postwar Air Force of the Italian Republic (Aeronautica Militare Italiana). In the 1960s it was opened to civil flights and Alitalia schedules regular flights to Rome, Catania, Palermo, Ancona, Venice. The routes were later taken over by ATI, using a Fokker F27 airplane. When ATI put into operation the new DC-9-30 it became necessary to create a new runway, while the military complex was still used as passenger terminal. In 1981 a new building was completed, originally intended to be used as a cargo terminal, but it became in fact the airport's new passenger terminal. In 1990, with the Football World Cup, the runway was extended and the terminal was upgraded, going through a further renovation in 2000. However, the traffic increase showed the infrastructural limitations of the airport and in 2002 the founding stone of the new passenger terminal was laid out. At the same time, flight infrastructures (aircraft parking areas, runway etc.) were upgraded. 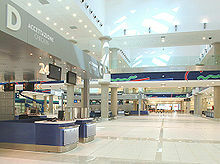 In 2005, the new terminal was completed and opened to passengers. In 2005, construction works for a new control tower began and they were completed the following year. In 2006 a further extension of the runway was begun, and in 2007 the planning of an extension of the passenger terminals was commissioned. They were upgraded in 2005–2006 with the opening of a new passenger terminal equipped with 4 jet bridges and a multistorey car park. The airport can be reached by the ring road of Bari and from the A14 motorway. The Bari metropolitan railway service connects the Airport with the Bari Centrale railway station in the city centre. AMTAB buses provide public transportation to the airport from the city centre (Line 16). Pugliairbus is a seasonal bus transportation service which operates interconnection service with Brindisi and Foggia airports. Pugliairbus also reaches turistic locations. On 6 August 2005, Tuninter Flight 1153, a Tuninter ATR 72 en route from Bari to Djerba, Tunisia, ditched into the Mediterranean Sea about 18 miles (29 km) from the city of Palermo. Sixteen of the thirty-nine people on board died. The accident resulted from engine fuel starvation. During maintenance the fuel quantity indicator (FQI) was changed using an FQI for an ATR 42 instead of an ATR 72. ^ Jim Liu (5 February 2018). "Air France expands seasonal routes from Paris CDG in 3Q18". Routes Online. ^ Tatiana Rokou (28 September 2018). "Budapest Airport reveals Ryanair's Italian routes". Travel Daily News. ^ Jim Liu (5 March 2017). "Ryanair W17 new routes as of 05MAR17". Routes Online. Wikimedia Commons has media related to Bari Karol Wojtyła Airport.